The Organic Decaf French Roast was roasted for you by Centri Coffee. This Organic certified decaf is a custom blend of rotating seasonal coffees from South America and was decaffeinated before using the chemical-free Swiss Water decaffeination method. 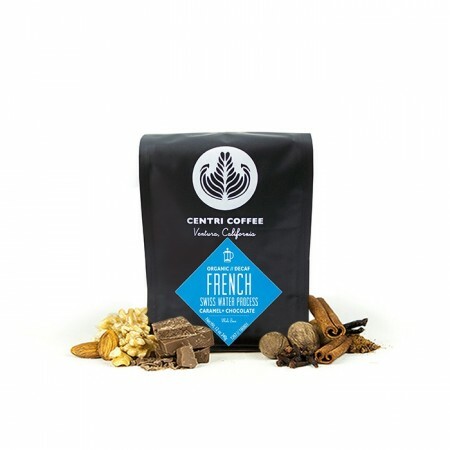 Decaf French Roast is roasted with a longer and slower profile to maximize development of its dominant flavor characteristics; a smoky roast quality, chocolate, and mulling spices. This is a pretty good version of what I generally don't like about decaf coffees, but is almost universal. I assume that coffee loses flavor in the decaffination process, and that most roasters want to make up for that by roasting the coffee extra deep, to come up with some strong flavor. The end result just ends up tasting like burnt to me. I ended up blending these beans 1:1:1 with some Coava and Olympia Coffee Roasters decafs that I had on hand, and that ended up tasting pretty nice.